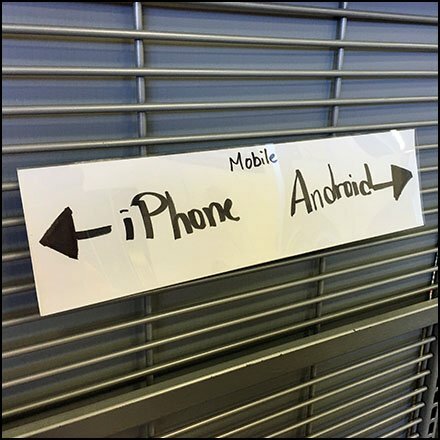 Part directional, part Category Management, the hand-lettered Do-It-Yourself Category Definition Endcap Sign says this way to the iPhone, that way to the Android sides of the display. To guarantee you are not confused a small “eyebrow” advises “Mobil” for the overarching Master Category. I have used both technologies but am a confirmed Apple and iPhone loyalist when it comes to personal choice. I am not sure if there is any significance to iPhone on the left and Android on the right other than Left-Handed individuals claim that they are generally more intelligent. I am right-handed so probably too dumb to know. This Do-It-Yourself Category Definition seen at Best Buy.